The Digital View Controller Utility is a Windows based software application to enable easy access and use of the various functions built into Digital View LCD controllers – the latest version, v1.25, is now available for download on the Digital View Software Page. SVH-1920v2 (start from V1.18.00 firmware). ALR-1920-SDI (start from V1.13.00 firmware). SVX-4096 (start from V1.06.00.00 firmware). DD-1920 Dual-DVI (start from V1.06.00 firmware). DD-1920 VGA (start from V1.02.00 firmware). DD-1920 DP (start from V1.01.00 firmware). DD-1920 HDBT (start from V1.12.00 firmware). Support for of the custom panel timing function for SVX-4096 providing a user-friendly interface to enter custom panel timings and download to the SVX-4096. 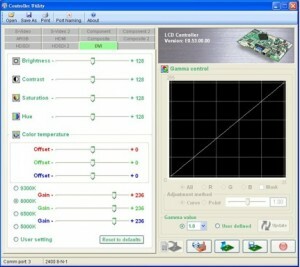 It allows controller users to input the panel timings to test the panels that have not yet been verified by DigitalView. Additional capabilities include the ability to save the custom timings file so that it can be passed to Digital View to add it to the firmware. A function to read back the custom panel timing values from the controllers (only for ALR-1400v2 and SVX-4096).